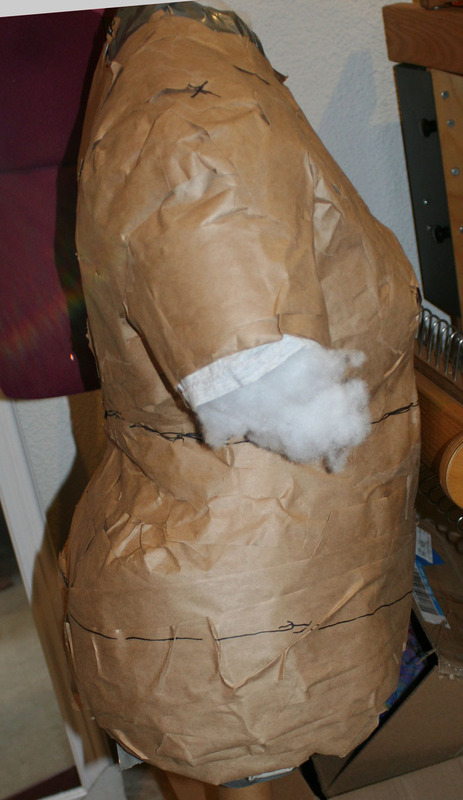 What with all this sewing, I decided I needed a dress form, as it’s an invaluable tool for fitting. So I invited a second guest artist to do a second interpretation.Â Mike was kind enough to help out.Â This time we cut all the paper strips into half (it was 3″ wide!) 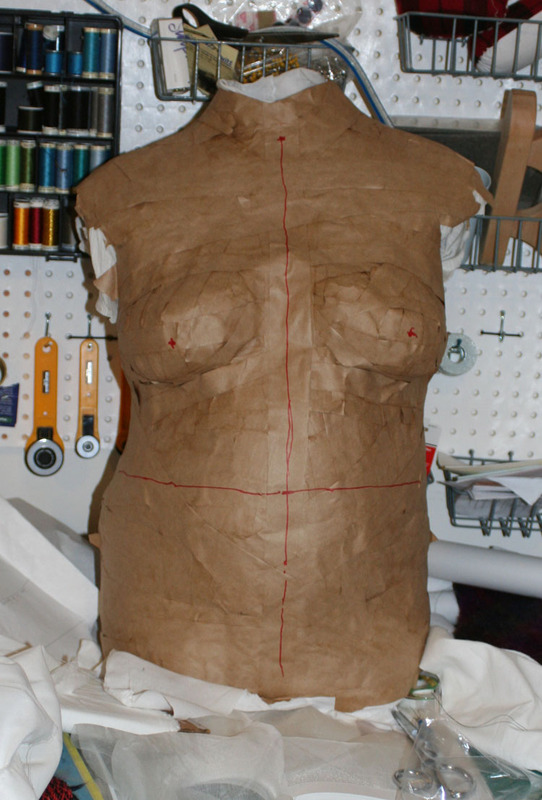 and into strips only 1″ wide for the bust, to give better definition. So I guess one shoulder really is significantly higher than the other.Â I hope I’m not suffering from scoliosis!Â The next time I’m by a health fair or a chiropractor I will have to get myself tested. 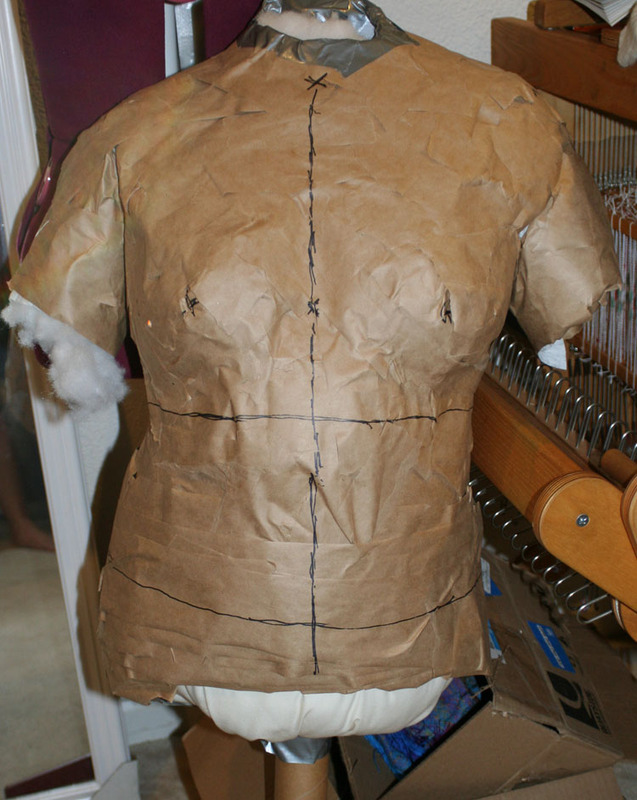 But it does tell me that I need to make the shoulder pads higher on one side, to balance out my figure. Anyway, if you don’t already have one of these, I suggest you make one – it only takes about two hours and they’re very nifty.Â I can’t wait to use mine! It’s not uncommon for people to have one shoulder higher than the other. 🙂 The paper tape ‘dummy’ looks really interesting. How on earth do you keep from giggling? I’m still trying to wrap my mind around the concept of not just two Tiens, but three. Shouldn’t the universe be collapsing around us or something? It’s always possible, if you’re holding one shoulder higher than another, that you’ve got something particularly sore or unusually tight on one side. You might want to get a good massage and/or wait a week and see if it’s still higher before making clothing in that shape. I did this too! 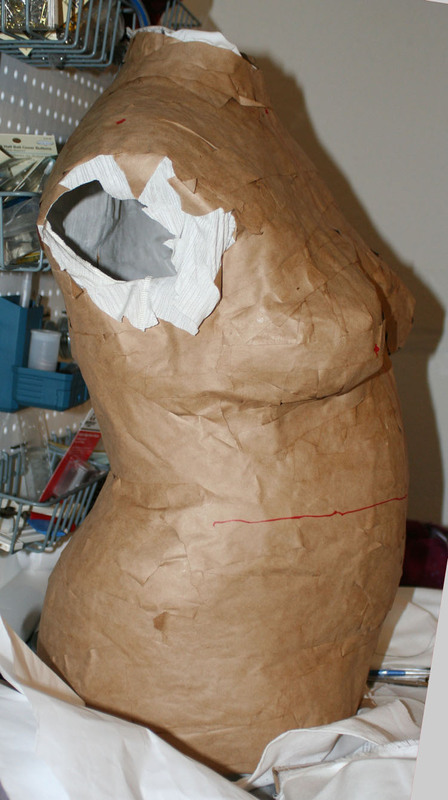 I love that it is MY shape and not just a dress dummy. 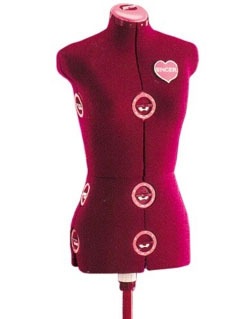 I want to try more garment sewing and this is just the thing I need. I may need to make a new one soon – I’m losing weight (yay!) and have lost at least 3 dress sizes. Time to break out the tape!